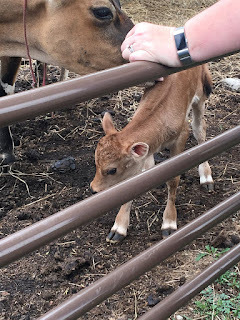 The Inquisitive Farmwife : Miss Molly had her baby! Oh Friends! I am WAY behind on sharing stories of the farm. I had planned to write a totally different blog until I realized I had not yet told you all about my Cow Molly, and the birth of her first calf! So, I'm a month behind.... but here it is! For months I had been preparing for the arrival of the new baby cow. Now, I grew up around beef cattle, mostly helping my dad and granddad from a distance. 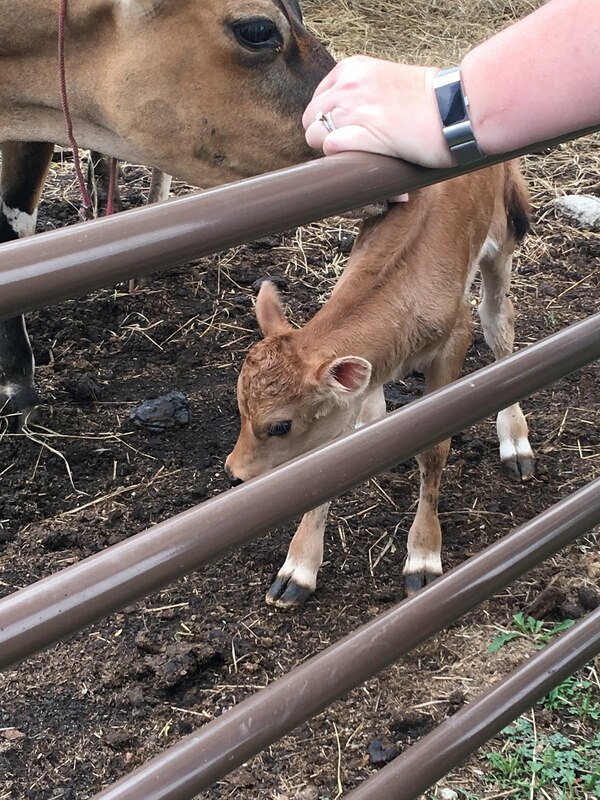 Such things as helping count cows, look for mommas in labor/distress, is the bull in the little pen, latch the outer gate when they go feed, etc. All small stuff, because ... well, because I was a small girl. I was in 2nd grade when we moved to town and dad slowly started transitioning from working the farm to working in town. I never did give up that desire to be a part of the farm... a steward of the land and animals that God gave us! So, many years later I married myself a handsome young man, and moved to a farm. Not until about 10 years into our marriage did I really take to the farmwife life and begin canning, gardening, and adding livestock. It all began with chickens..... they're the gateway I tell ya.... Look at me... off track. So here we are preparing... 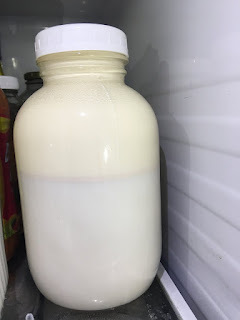 I was just THRILLED to find a machine milker! Happens to be that one of my "farm" neighbors sold me his for a fair price! My budget was super small, so that was super GREAT! We took the 2 hour trip to the milk place and got all new hoses and such. I was ready.... excited ... and nervous about our FIRST calf on the farm! Well, when we purchased Molly back in December, she was already bred to a miniature jersey. They had two "dates" and so she was either to be due in April or June. My first instinct was June, and how cool would that be if she calved on my birthday? Well, I had my local vet come out and check her overall health and see if he could guess a due date by "bouncing" her. His guess was also June, but said to be prepared in April, as it is a miniature cow and could be further along, just a smaller baby. So we waited, and waited and waited! April was a busy month for us. That's when all of our dairy goats kidded. There were babies EVERYWHERE! 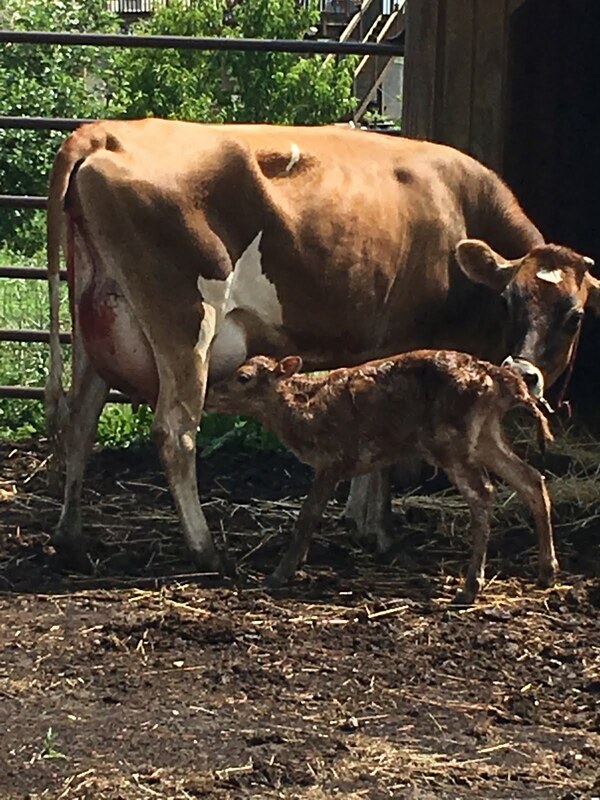 I was almost relieved that Molly did not calve as I would now have time to spend with her and baby calf, whenever it chose to arrive. May seemed to last an eternity, but I was keeping myself busy helping the farmer with planting our field crops, and trying to put in a garden of my own. June came, my birthday passed, and I just got used to the routine of Farmers Market, baseball games, and all the activities that Summer brings. And low and behold ... on the morning of June 12th, during my regular chore routine I see that Molly is in labor! What... oh now... uh... I need help! The goats still need milked and the chickens want fed, the ducks get fresh water... OH MY! SO in I ran to the house and grabbed the children from their slumber. My youngest is a boy, and a bit on the squeamish side, so he helped me with the chores, while my middle child (daughter) watched Molly for any distress, and was to yell at me if things got super close! I did NOT want to miss this birth! 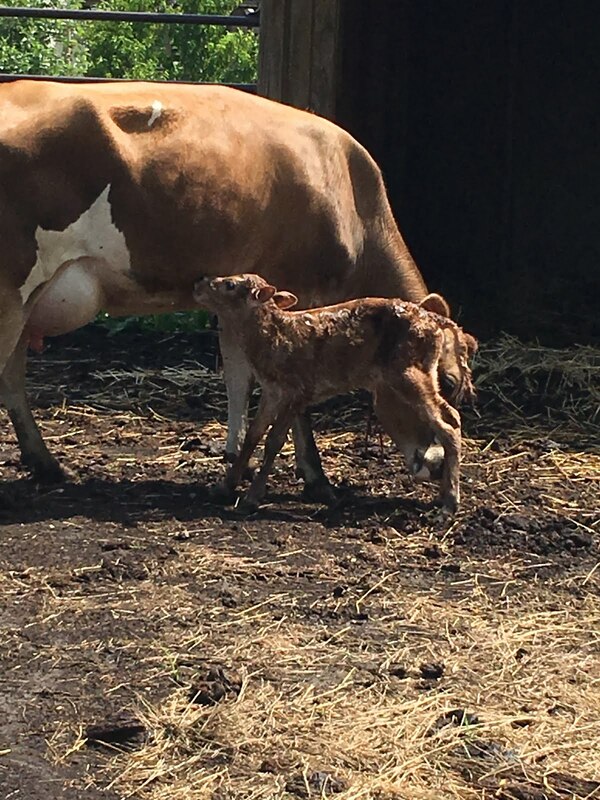 I called my sister, and she got in the car and headed up to the farm, making it JUST IN TIME to witness the birth. Shortly after my mother and grandmother came to visit the new calf. It was an exciting and busy morning for sure! So, with the help of my son, I was able to fly through the morning chore routine, and grab my phone to take a few pictures. My daughter was hollering at me... hurry mom hurry! I grabbed the ATV and off I went. We see feet.... it's happening... it's almost time to meet the baby calf! I was beside myself with excitement! My mind filling with questions.... do I go comfort her, do I leave her alone, will she need help...oh please don't need help! And before you knew it, baby was on the ground. Molly did a GREAT job with the whole thing. She's still a great momma today! Well, you can't see anything from outside the fence, so I got brave and hoped that Molly was tired enough that she wouldn't be a mean momma and kick me in my tail end. She wasn't! She was super cool with me being in there. Let me touch and pet baby with no issues at all, still does! But ... we ALL needed to know. What's in the undercarriage!!!!! Well.... I see udders! Yup, that's correct, we got a Heifer! 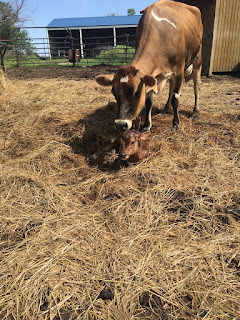 Hooray.... molly had a girl! I had planned on calling her June Bug (born in June) but the hubby though Holly was fitting... so in hopes he'll let me keep her... I let him choose the name! Once things calmed down a bit, I realized that we had not finished setting up the cow milking area, and that Molly was super full and would need milked out soon! So I pleaded (not really, he's a super great guy) with the farmer to help me figure out what I needed to get this all going. We headed to the farm store and got what few supplies we had forgotten in all the previous trips, and headed home! And within a few hours we are milking our very first dairy cow for the very first time, after her very first calf! What an exciting day! So now you know the story of Molly and Holly. Look to hear lots more about them in the future along with what to do with all this delicious milk! You have a great day folks, it's time for me to head out to chores... the animals really like that routine!!! And it's good for me too! Wow, look at all the cream in that jar of milk! Congratulations on your new little heifer calf. Thanks, it’s been an exciting adventure! Wow, it all looks so exciting! Thanks for sharing!